3rd edition, Capitol Records label, Capitol Records Pressing Plant, Winchester pressing. 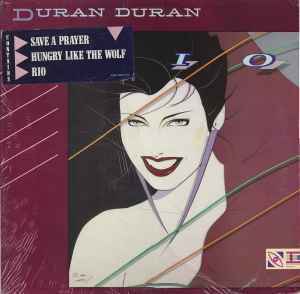 "Hungry Like The Wolf" is the "Night Version" mixed by Colin Thurston, all other tracks on Side A are the so-called "US Mixes" remixed by David Kershenbaum. Remix credits had been added to the inner sleeve, compared to 2nd edition. All 'Rio' lacquers, cut in-contract by TML and Precision Mastering, show a "Z" in the runout matrix and had been consecutively numbered. Except Z-1 and Z-4, the numbering system counts A- and B-side lacquers separately and was used for all three album variants. DURAN DURAN ROCKS hand etched into matrix. Very finely stamped numbers but not much else.